"The Abruzzi Symphony numbers only 34 players, clearly eager to please, and their spirited and buoyant playing under the alert leadership of Maestro Quattrocchi benefits from clear, bright sound….an absolute model of such sorely under appreciated fare should be presented." “The immediate predecessor to the modern, multi-movement symphony was the eighteenth century opera overture, particularly as it was cultivated in Italy. Even after the symphony gained currency as a separate entity starting in the 1750s, the multi-movement opera overture continued to thrive until the more efficient single-movement model took hold around 1780. This is the area of the repertoire that Bongiovanni's Sinfonie Avanti l'Opera Intorno a Mozart (Symphonies before the Opera from the Time of Mozart) is designed to explore. Francesco Quattrocchi leads the Orchestra Sinfonica Abruzzese in 10 overtures from the period 1762-1790 in energetic, sparkling, and dynamically three-dimensional performances. 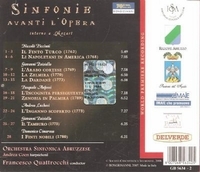 While Quattrocchi doesn't favor one overture over the others in terms of treatment, Piccinni's overture to If Finto Turco and Paisiello's to L'Arabo Cortese are noteworthy for their intensely engaging and rousing music, and Paisiello's overture to La Zelmira stands out for its fragmented and eccentric use of rhythm. The others by Anfossi, Lucchesi, and Cimarosa are also fine; there is not a bad one in the bunch.